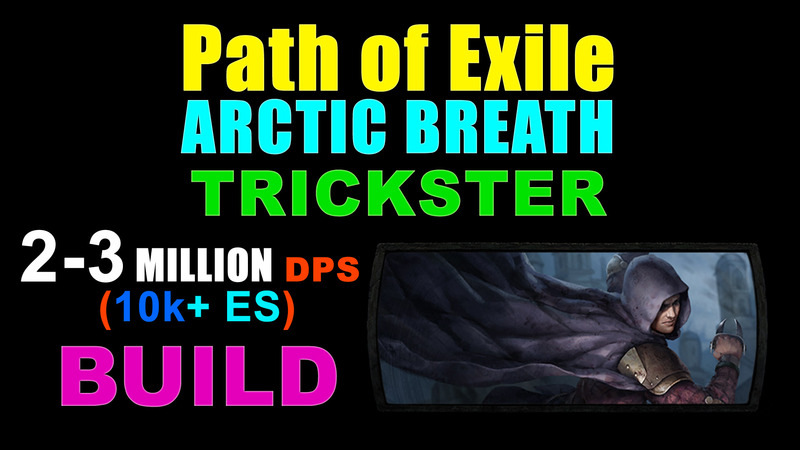 [3.6] ARCTIC BREATH Trickster (2-3 Million DPS). UBER ELDER done! Big props to Invalesco's Cold Snap/Vortex build here: https://www.pathofexile.com/forum/view-thread/2288726 . If you are looking for one: look no further. Some ideas (like proper Bonechill calculations) are inspired by his build. How does Arctic Breath / Cold Snap combo works? Arctic Breath is a projectile cold spell which explodes on impact creating CHILLING area which does cold damage over time and crawls towards enemies. Up to 10 areas at once (do NOT stack!). So it's like you shoot your Cold Snaps. At the same time we actually have Cold Snap on top of it, which gives Frenzy Charges as well as provides massive cold buff to Arctic Breath via Bonechill support gem. With Frost Bomb, Elemental Weakness and Cinderswallow Urn procced by Armageddon Brand for both Elemental Overload and EE at once, all on top of everything else we achieve massive 3.5 MILLION dps. -Low-Life Chest (Shavronne's Wrappings) is usually very expensive at the start of the league, so you will playing CI for a while. For Ascendancy: Patient Reaper, Ghost Dance, Escape Artist, Prolonged Pain. Start using Cold Snap early on too! Rime Gaze is pretty mandatory for top DPS, with second bests being Vertex, Doedre Skorn and Heretic Veil. Belts: Bated Breath, Stygian Wise with Fossil crafted %Cold Damage, or Crystal Belt. Also https://pathofexile.gamepedia.com/Ascent_From_Flesh is a good starter. Aegis Aurora is the BEST unique shield for the build. with Discipline + Discipline / Malevolence Aul's Uprising is not a bad combo-wombo. 1) Multimodded Void / Opal Sceptre with cold DoT (expensive). In order to make this you need a lot of unveiled mods available. b) buy a FRACTURED/Synthesized Sceptre base (either clean or regal/annul) and multimid straight (1c to 2ex for BASE depending on your luck). There is a 50%/50% chance though, since you can annul the cold DoT as well. Cinderswallow Urn with regeneration / Crit Chance is also great! https://pathofexile.gamepedia.com/Bottled_Faith . 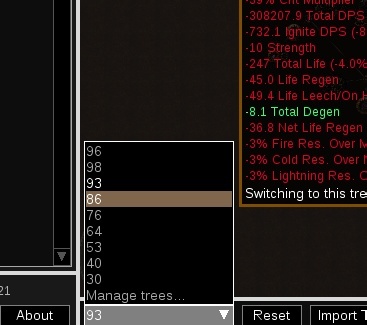 I had to manually add a mod to it in PoB to reflect actual DPS. +1-2 Shavronne, +1 Curse amulet with something useful, like strength/dex and ES. 1) Can i do it as Occultist? Great Guide, i am trying this build, lets see if i can make it work. Thanx! Almost relevelled in synthesis so will be updating gear section soon! How Arctic Breath is better than Vortex? Vortex is cooldown based, so if you don't have dat helm enchant it will take a while before you can leave another single swirling poopie. With AB however you can leave 10 crawling puddles of cold poo in 1 second with GMP. I started off thinking I wanted energy shield& life hybrid, just a lot of shield and bulk because my inquisitor was dying a lot. But I heard someone talk about Mind over Matter , sounded a little like Quick Thinking (one of my favorite Warframe mods, use your mana as extra life) so I knew I needed to get that. I am going for the same ascendancies as you, just need Escape Artist. I took Phase Acrobatics and happened to get some good 30% move speed +12% Dodge boots, and some other nice starter mapping gear I have found and affixed, and it's a really good time!